This is what my daughter and I do all the time. She is the act and I am the director. My wife would be telling us to stop this. But we ignore her all the time. 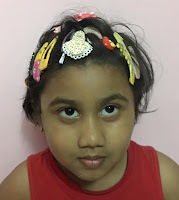 In this video my daughter explains how to use hair clips effectively. She used a total of 25 clips on her hair in this video.